Ambulocetus (meaning "walking whale") is an early cetacean from Pakistan. It is named as such because it had short limbs and large feet used for swimming. Along with other members of Ambulocetidae, it is a transitional fossil that shows how whales evolved from land-living mammals. 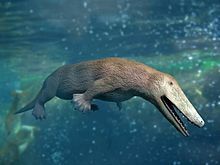 While its name stems from the historical hypothesis that it was capable of walking on land, more recent research suggests that it was fully aquatic like modern cetaceans. Ambulocetus was probably fully aquatic like modern cetaceans, with a similar thoracic morphology, and it probably swam by undulating its back vertically. Chemical analysis of its teeth shows that it could move between salt and fresh water. It also lacked external ears. Its skull had a long snout and eyes facing sideways (they faced upward in pakicetids), located high on the skull like in modern hippos. Ambulocetus had a feeding morphology similar to that of crocodiles: a long snout, pointed teeth, and strong jaw adductor muscles. Like crocodilians, Ambulocetus probably killed its prey by holding it in its jaw and either drowning it or thrashing it with violent motions. Similar to larger crocodilians, adult Ambulocetus probably were ambush predators that fed on larger fish, aquatic tetrapods and possibly terrestrial animals near the water. In contrast to crocodilians, it may have chewed its prey but probably did minimal food processing with its teeth. Size comparison between Ambulocetus and a human. Ambulocetus was the size of a male sea lion, much larger than Pakicetus. The body weight of Ambulocetus is estimated at 141–235 kg (311–518 lb), while Philip D. Gingerich estimated it at 720 kg (1,590 lb). The short forelimbs of Ambulocetus had five fingers on each hand and its long hindlimbs had four toes on each foot. It had dense osteosclerotic limb bones, suggesting it was well-adapted for living in water but moved slowly, probably hunting as an ambush predator. Its pelvis was attached to its spine, like land mammals and unlike later whales. Its powerful tail, which lacked a tail fluke, was apparently used for locomotion, and it probably moved similar to a modern river otter. Pakicetids and ambulocetids used their large feet and hind limbs for propulsion; morphologically, the thigh and leg of Ambulocetus were shortened, but the feet stayed large; this resulted in a reduction in lever arm but a retention of a large propulsive surface, indicating that the hind limb functioned as an oar. In later Eocene cetaceans, such as the basilosaurids and remingtonocetids, the tail gained a fluke and became the dominating source of propulsion, while the leg became more reduced and rudimentary. Ambulocetus was probably an ambush predator, hunting large and vulnerable prey much like a modern crocodile. Unlike crocodiles, all fossils of Ambulocetus have been found in sediments deposited in a nearshore marine environment. The eyes were high on the skull, suggesting a keen interest in prey above the water table. It had large feet for paddling or, when pressed together, for powering by an undulating back. The location of Ambulocetus’ nose opening (the blowhole of later whales) remains a mystery. Throughout whale evolution, the opening shifts from the tip of the snout back to the forehead. The position of the nose on Ambulocetus can only be inferred based on other early cetacean fossils, since the tip of the snout was not recovered. Ambulocetus was recovered from the Early Eocene (47.8-41.3 Ma) Kuldana Formation of Punjab, Pakistan (33°36′N 72°12′E﻿ / ﻿33.6°N 72.2°E﻿ / 33.6; 72.2, paleo coordinates 14°18′N 68°18′E﻿ / ﻿14.3°N 68.3°E﻿ / 14.3; 68.3) in 1993 by Johannes G.M. Thewissen and Sayed Taseer Hussain, and was described by Thewissen, Hussain, and Mohammad Arif in 1994. It is believed to be from the Lutetian age of the Paleogene period (48.6 to 40.4 million years ago). Fewer than ten ambulocetid fossils have been found, all in shallow sea or coastal swamp environments. Ambulocetus is the only virtually complete skeleton known from the group. At the time when the animal was alive during the Eocene, the length of Pakistan was a coastal region of Eurasia, as India had not yet collided with Asia. The most complete specimen of Ambulocetus includes the skull (without the snout), the lower jaw, the vertebral column (except for a number of tail vertebrae), ribs, forelimb from the elbow down, and most of the hind limb. It was found in rocks that were formed in a swampy, coastal environment. It has been proposed that it was an ambush hunter, similar to modern crocodiles. The eyes were high on the skull, suggesting that it was keenly interested in prey above the water table. It had large feet that were used in paddling, or held together, powered by the undulating back. The position of the nose can only be inferred since the tip of the snout was not recovered. Both whales more basal on the phylogenetic tree (pakicetids) and higher ones (remingtonocetids) have a nose opening at the tip of the snout. Ambulocetus is classified under the monophyletic family Ambulocetidae. The family is believed to have diverged from the more terrestrial Pakicetidae. The families Protocetidae and possibly Remingtonocetidae, are believed to have arisen from a common ancestor with ambulocetids. Together with Basilosauridae, the five families are classified under the suborder Archaeoceti. Ambulocetus has featured in a number of museum exhibits, biology textbooks, and even a cold war spy novel where Ambulocetus lives in ice caves near a submarine base in the Arctic. ^ a b Ando, K.; Fujiwara, S.-I. (2016). "Farewell to life on land – thoracic strength as a new indicator to determine paleoecology in secondary aquatic mammals". Journal of Anatomy. 229 (6): 768–777. doi:10.1111/joa.12518. PMC 5108153. PMID 27396988. ^ a b c d e f g h Thewissen, Hans (Nov 2014). The Walking Whales From Land to Water in Eight Million Years (First ed.). University of California Press; First edition. ISBN 978-0520277069. Retrieved 28 November 2018. ^ Thewissen, J. G. M.; Cooper, Lisa Noelle; George, John C.; Bajpai, Sunil (2009). "From Land to Water: the Origin of Whales, Dolphins, and Porpoises" (PDF). Evolution: Education and Outreach. 2 (2): 272–288. doi:10.1007/s12052-009-0135-2. Archived from the original (PDF) on 2012-07-14. Retrieved 2016-06-19. ^ a b c Thewissen, J. G. M.; Madar, S.I. ; Hussain, S.T. (1996). Ambulocetus natans, an Eocene cetacean (Mammalia) from Pakistan (PDF). Courier Forschungsinstitut Senckenberg. 191. pp. 1–86. ISBN 9783929907322. OCLC 36463214. ^ Marx, Felix; Lambert, Oliver; Uhen, Mark (2016). Cetacean Paleobiology (TOPA Topics in Paleobiology) (1st ed.). Wiley-Blackwell. ISBN 978-1118561270. ^ Thewissen, J. G. M. (2013). "Cetacean Origins: Evolutionary Turmoil during the Invasion of the Oceans". In Thewissen, J. G. M. (ed.). The Emergence of Whales: Evolutionary Patterns in the Origin of Cetacea. Springer. pp. 451–460. ISBN 9781489901590. ^ a b Kemp, T. S. (2005). The Origin and Evolution of Mammals (PDF). Oxford University Press. ISBN 978-0-19-850760-4. OCLC 232311794. ^ Thewissen, J. G. M.; Cohn, M. J.; Stevens, L. S.; Bajpai, S.; Heyning, J.; Horton, W. E. (2006). "Developmental basis for hind-limb loss in dolphins and origin of the cetacean bodyplan" (PDF). PNAS. 103 (22): 8414–8418. Bibcode:2006PNAS..103.8414T. doi:10.1073/pnas.0602920103. PMC 1482506. PMID 16717186. ^ Würsig, Bernd (2008). Encyclopedia of Marine Mammals (2nd ed.). Academic Press. ISBN 9780080919935. ^ a b Thewissen, J.G.M. (14 January 1994). "Fossil Evidence for the Origin of Aquatic Locomotion in Archaeocete Whales". Science. 263 (5144): 210–212. Bibcode:1994Sci...263..210T. doi:10.1126/science.263.5144.210. ^ a b Holmes, Bob. "A life spent chasing down how whales evolved". New Scientist. New Scientist. Retrieved December 2, 2018. ^ a b "H-GSP 9210 (Eocene of Pakistan)". Paleobiology Database. 2005. ^ Thewissen, J. G. M.; Hussain, S. T.; Arif, M. (1994). "Fossil evidence for the origin of aquatic locomotion in archaeocete whales". Science. 263 (5144): 210–212. Bibcode:1994Sci...263..210T. doi:10.1126/science.263.5144.210. PMID 17839179. ^ Gould, Stephen Jay. "Hooking Leviathan by Its Past". The Unofficial Stephen Jay Gould Website. Retrieved 30 November 2018. ^ Uhen, M. D. (1998). "Phylogenetic relationships of Basilosaurids". In Thewissen, J. G. M. (ed.). The Emergence of Whales: Evolutionary Patterns in the Origin of Cetacea. Springer. p. 43. ISBN 978-0-306-45853-8. ^ Rose, K. D. (2006). The Beginning of the Age of Mammals. JHU Press. ISBN 978-0-8018-8472-6. ^ "Whales, Tohorā". Museum of New Zealand. 2018-01-19. ^ "ROM Blue Whales". ROM. ^ "Forerunners of Aquatic Mammals". Japanese Museum of Nature and Science. ^ Zimmer, Carl; Emlen, Douglas (2015-09-07). Evolution, Making Sense of Life. Freeman. ISBN 978-1936221554. ^ Rollins, James (October 13, 2009). Ice Hunt. HarperCollins Publishers. ISBN 978-0752883823.